Plus Videos for "Neon Knights," "Die Young," and "TV Crimes"
This first-ever Black Sabbath compilation spotlighting the legendary band's Ronnie James Dio-fronted era just got a whole lot heavier with its release as an enhanced Music Video Interactive (MVI) Disc. Spanning 1980-2006, the sixteen thundering tracks that appeared on the original CD release of this collection (which is included as a bonus disc) are now also presented in Advanced Resolution PCM Stereo mixes. 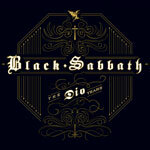 Videos and other interactive bonus content make BLACK SABBATH - THE DIO YEARS (MVI) an experience that truly rules. MVI is an innovative DVD-based music format that, in addition to offering all the benefits of an audio disc, delivers leading-edge video and interactive extras, plus a one-click capability to save digital music files onto a hard drive. Choice video content on BLACK SABBATH - THE DIO YEARS (MVI) includes footage of live performances of “Neon Nights” and “Die Young” from 1980 and a promo clip for 1992's “TV Crimes.” The MVI Disc also features the URTone ringtone application and ringtones for “Heaven And Hell” and “The Mob Rules,” plus a photo gallery, buddy icons, wallpapers, weblinks/ROM and a complete booklet PDF. When Ronnie James Dio took over lead vocals for Black Sabbath in 1979 after Ozzy Osbourne's departure, he'd already won fans worldwide as front man for Elf and Rainbow. The creative spark ignited by Dio's arrival - joining original Sabbath members Tony Iommi and Geezer Butler and Vinny Appice - delivered the 1980 metal masterpiece Heaven And Hell. A Top 40 album considered one of group's finest, its title became the name of the reunited Dio-fronted Sabbath that toured internationally to sold out crowds throughout 2006. 1981's The Mob Rules followed, continuing Sabbath's resurgence before Dio left for solo superstardom.